Episode 6 – Geetha's Story! 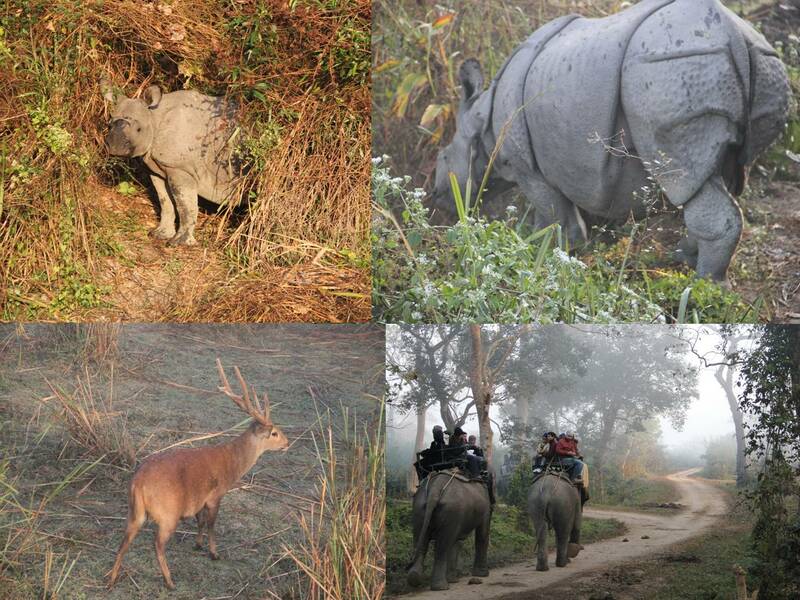 It was a beautiful morning and with great excitement one would await an event such as this at Kaziranga national park. Among the four gates of the national park, the central gate is usually visited by Government officials and would be closed for tourists in such case and hence many tourists had gathered in front of the Kohra gate which is about 10 kilometers away. People gathered at an assembly point after having paid Rs 350 per head and Rs 40 extra if they held a digital camera. First set of tourists were already witnessing something spectacular and had arrived at 5:30 AM, which was the first ride into the forest with one following every hour until 4:00 PM. As people stood waiting for their ride to return from its previous trip, they witnessed a beautiful sight. A huge wild buffalo crossed the road not before stopping for a moment to witness the crowd. Behind a thin film of mist the buffalo looked even more majestic than it already is. And then the elephants arrived, making its way through the forest, carrying many more tourists. The elephants; may be 15 of them, unlikely of what one may expect of its built, tolerantly waited till the last tourist had stepped out of their backs and a new set of them boarded. Among them was Geetha; comparatively thin in built carrying six tourists and a mahout on her back, she walked into the forest; taking a route that perhaps she has taken million times before and could do it with her eyes closed. En route the tourists stopped her to view the deer’s, storks, egrets and more wild buffaloes. But no rhinos in sight yet. Mahout noticed some imbalance in the seating and requested the tourists to sit in a fashion that would manage the imbalance. Geetha, tired of her usual route, tried to amuse the tourists by taking a detour and making her way into the bushes by breaking the branches with her flexible but strong trunks. The tourists cheered and laughed but the mahout was not happy. He used a big nail to prick Geetha at the back of her ears when according to him, she was misbehaving. No doubt she was only trying to be creative in her otherwise monotonous life. The animals were either grazing or drinking water and Geetha too took her share as she walked. And during one such detour she noticed something in the bush and began to chase it. Out came a rhinoceros lazily. People yelled and clicked pictures, the elephants surrounded it but the Rihno turning its back to all and giving an occasional glance of surprise slowly moved into the grass land from its hide out. Thanks to Geetha everyone could go very close to the Rhino. Just then a baby Rhino came out of its hideout and stared at the tourists. It was Geetha and her freinds, because of whom everyone felt safe and courageous. The mahout may be proud that he controls the elephant but if it weren’t for these elephants, one could hardly be here at this moment. It was not humans that the other animals in the forest were welcoming but Geetha and her friends who were very much of their kind still. If one was sitting on Geetha that moment, one would feel very heavy. One does realize their weight only when they burden themselves on someone else's back. One wonders if the tourists thought so with seven people , a metal seating and thick cushions on her back. But would Geetha complain? Never. Few kind tourists offered banana to her and she gobbled them in a go. As another set of tourists finished their elephant ride the wild animals went back to their routine tasks. The rhinos returned back to the bushes, the buffaloes drank more water from the lakes, the birds flew from one tree to another and the deer’s raced from one end of the park to another. But only one animal seemed to work hard – Geetha and her 14 friends who stood by the assembly point, looking for the millionth time at new faces filled with a similar expression of excitement to experience something interesting for the first time.